US Coast Guard/Chief Petty Officer David MosleyThe Coast Guard Cutter Polar Star cuts through Antarctic ice in the Ross Sea near a large group of seals as the ship’s crew creates a navigation channel for supply ships, January 16, 2017. The Coast Guard currently only has one operational heavy icebreaker to keep polar regions accessible. The service has been pushing for funding to rebuild its icebreaker fleet for some time. President Donald Trump’s proposed 2019 budget provides nearly a billion dollars to start that construction. The Homeland Security Department’s proposed budget for fiscal year 2019 requests $US2 billion to recapitalize the Coast Guard’s surface fleet – notably $US750 million to design and build the US’s “first new heavy polar icebreaker in over 40 years,” according to details released on Monday as part of President Donald Trump’s budget request. The Coast Guard’s total request for the next fiscal year is a little over $US11.65 billion – an increase of 8.4%, or $US979 million, over the amount requested for fiscal year 2018. The budget request includes several big-ticket projects for the Coast Guard, including $US15 million to support the Service Life Extension Project for the Polar Star, the service’s only operational heavy polar icebreaker. The Polar Star entered service in the mid-1970s and was refurbished in 2012 and is now well past its 30-year service life – “literally on life support,” Coast Guard Commandant Adm. Paul Zukunft has said. 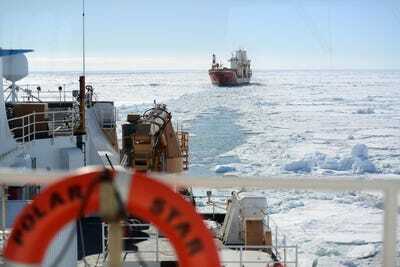 Its sister ship, Polar Sea, is no longer in service and now provides parts to keep the Star running. US Coast Guard/Chief Petty Officer David MosleyThe crew of the motor vessel Ocean Giant lines up with the US Coast Guard Cutter Polar Star to be escorted to the National Science Foundation’s McMurdo Station, January 25, 2017. Zukunft, who assumed command of the Coast Guard in 2014, has been a driving force behind efforts to acquire a new icebreaker and has said he eventually wants to add three heavy and three medium icebreakers. In fall 2017, the Coast Guard and the Navy issued a joint draft request for proposal to build the next heavy polar icebreaker with an option for two more. “When I came into this job, we thought: ‘Well, hey, we can wait a while before we address icebreakers. Maybe we can wait another four or five years.’ Well, if we wait another four or five years, as difficult as it is to find an appropriation today, it’s not going to get easier any time in the future, at least when I look into my crystal ball,” Zukunft told Business Insider at the end of 2017. In addition to money apportioned to icebreaker sustainment and development, the 2019 budget would direct $US400 million to start construction of a second offshore patrol cutter and provide long-lead-time materials for a third. The offshore patrol cutter is meant to replace the service’s medium-endurance cutters, which operate on the high seas and in coastal approaches. Another $US240 million is designated for four fast-response cutters. FRCs are meant to replace the service’s 110-foot patrol boats and improve the Coast Guard’s ability to carry out search-and-rescue, border-security, drug-interdiction, and disaster-response operations. The four new FRCs will bring the service to 52 of the program’s planned 58 ships. An additional $US5 million is apportioned to support the service’s waterways-commerce cutter, a program that may replace the ageing fleet of inland tenders and barges that operate on US inland waterways, assisting the movement of $US4.6 trillion in economic activity that makes use of US ports and waterways every year, according to the budget document. 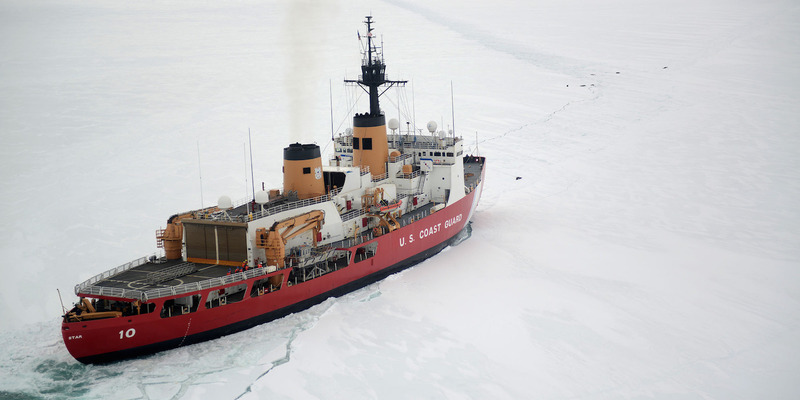 While the budget requests highlight several programs involving the Coast Guard’s surface assets, the replacement of the icebreaker fleet has been a high-profile goal for some time. The ageing Polar Star is the only ship the service has to support year-round access to Antarctic and Arctic regions – the latter of which has seen increasing activity as polar ice recedes, opening new channels for commerce and natural-resource exploration. Operations by other countries in the region – particularly Russia, which already has a large icebreaker fleet – have been a particular point of concern for US policymakers. Some experts have said the Russian icebreaker fleet is less of a concern than its resurgent navy, and Coast Guard officials, including Zukunft, have highlighted the service’s positive interactions with its Russian counterparts.But the commandant also sounded a note of caution about US policy toward the northern latitudes going forward.